Stay in Italy and ski into France on a school ski trip to Claviere! The Italian resort of Claviere sits right on the French border, which allows you the exciting opportunity to ski into the French resort of Montgenèvre. The traditional mountain village of Claviere is a charming mix of old and new, set amidst a breathtaking backdrop, and offers all you could ever want from a ski resort. Claviere is a very relaxed and quiet ski resort, where the friendly locals offer a warm welcome. There are a number of shops and restaurants, as well as a natural ice rink. And there are plenty of après-ski activities to keep your students entertained when they’re not skiing. All this makes Italy’s oldest resort the perfect choice for your next school ski holiday. The resort sits at an altitude of 1760m, with the top station at 2849m so, as you would expect, the snow conditions are usually very good. The area does, in general, have an excellent snow record and, with many north-facing slopes, tends to keep snow well. Thanks to the Monti Della Luna pass, you’ll have access to over 110km of pistes, including Claviere and Cesana. Any first-timers in your group will love the beginners’ area, which is both snow-reliable and uncrowded. For the more experienced skiers there are plenty of blues, reds and even Olympic runs. And there’s a great variety of high, wide, open pistes and attractive tree-lined runs back to the village. Your pass will give you one day’s skiing in Montgenèvre and one days’ skiing in the whole of the Milky Way, to which Claviere is one of the access points. We can include a 6-day Milky Way pass for a small supplement. 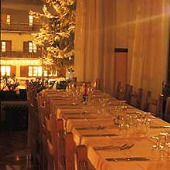 The popular Hotel Miramonti is a family run hotel and offers good accommodation for schools just a few minutes' walk from the main ski area in Claviere. 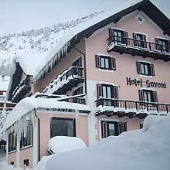 The hotel occupies an elevated position with some great views, and as a smaller hotel it would be possible for a large group to have sole occupancy, making this the perfect base for a wonderful ski trip. The bar and restaurant area of the hotel is an excellent place to run any in-house après ski activities, and if more entertainment is required the main resort area is at the bottom of the hotel’s drive which means that everything is within easy reach. As such, hot lunches can be taken at the hotel and walking in ski boots and carrying skis is kept to a minimum. Rooms are basic but clean and functional all with ensuite facilities. The Hotel Savoia enjoys a convenient location close to the centre of Claviere. All Bedrooms are ensuite. The hotel is well suited for groups, having a Restaurant, Bar Lounge and TV room that could be used for group events. It also has ski storage onsite. Out of the hotel there is Ice Skating within walking distance of the hotel and a visit to a local pizzeria would offer a traditional taste of Italy. Further afield is the French town of Briançon with its pedestrianised old city, its shops or even its swimming pool for a change of sport. Ice skate whilst surrounded by the most stunning mountain setting at this fantastic open-air ice rink. Warm yourself up with a delicious hot chocolate to follow! Only at 7 miles from Sansicario and 11 miles from Sestriere! Rent some toboggans and take to the slopes! Pupils always enjoy tobogganing, as it is a fun way to explore the slopes. Swimming is a fantastic activity for groups and this indoor 25m swimming pool in Briançon is just 8.5 miles from Claviere. This fantastic indoor ice rink is located just 8.5 miles from Claviere. The rink is Olympic-sized (60m x 30m), giving your group plenty of space to show off their skills! Growing in popularity, snowshoeing is a fantastic activity for your pupils to have a go at! The walk lasts approximately 2h, and you will walk through the snow with specially-designed snowshoes. This activity is possible at night or in daylight. Continue your enjoyment of the mountain after dinner, with a session of skidooing. This activity takes place outside a lovely, traditional Piemontese restaurant called La Coche. The owner, Luca, will meet your group in front of the ski school in Claviere, before you ascend to 1948m, where the restaurant is located. After enjoying the spectacular landscape from an entirely different perspective, you can warm yourselves up with a delicious hot chocolate and a piece of homemade cake. Enjoy pizza in Claviere, in a lovely pizza restaurant in Montgènevre, or in Cesana the perfect opportunity to enjoy a traditional Italian pizza experience! There's nothing better than a disco night to celebrate the end of your trip. What better way to relax than a session in the spa? This activity is suitable for all group members! Located just 2 miles from Claviere in Montgenèvre,France. Enjoy an evening of snow tubing at Park Le Manavelle.